On my previous visits to Singapore, I found myself unable to stray far from the city’s powerfully addictive comfort foods, be it the alluring Hainanese chicken rice, the punchy char kway teow, or the tongue-singeing chilli crab. Last week, however, I have discovered an awe-inspiring French bistro that managed to take my mind off the local goodies that I was so fond of. Opened by husband and wife, Adrian Ling and Cleo Chiang-Ling, Pamplemousse (which means grapefruit in French) is a Bistro & Bar presenting unique dishes that have been inspired by the couple’s travels around the world. Taking classic European dishes and perfecting them with creative infusions, Pamplemousse took me on a journey of culinary surprises and gastronomic delights. Situated in the hip quarter of Demsey, the interior of Pamplemousse is sleek and chic, with tall ceilings and grand marble pillars impressing its every diner. 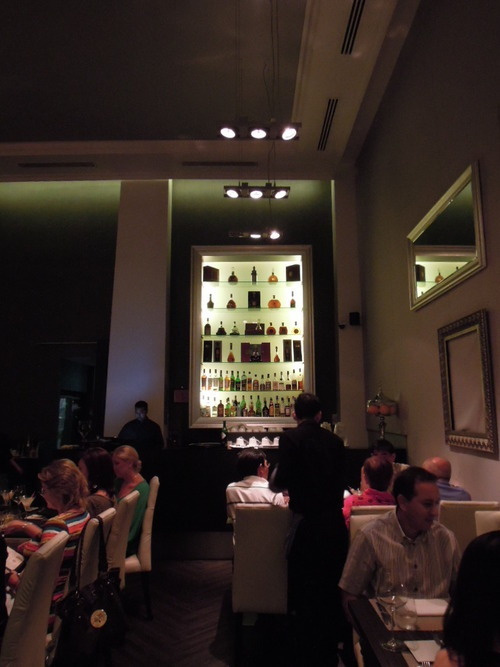 The service was efficient and convivial, and the menu was filled with tantalizing dish names and unusual ingredients to beguile our hungry minds. 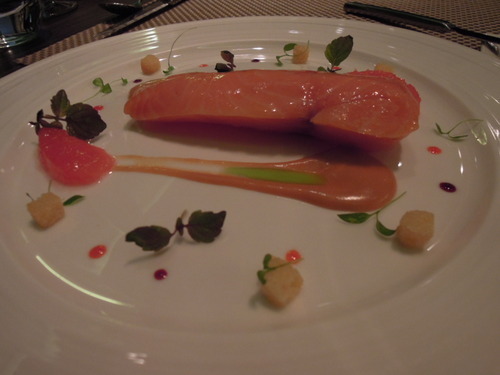 (1) We were first presented with the citrus marinated Salmon served with Pamplemousse confit, Saikyo miso aioli and croutons. There was clearly talent in the kitchen, and the silky salmon melted like butter in the mouth. 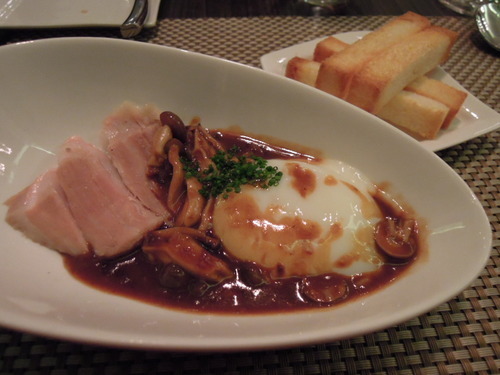 (2) The next concoction from the kitchen was a Soft Boiled Egg, which was breathtakingly delicate and runny. Served with some Honshimeiji mushrooms and decadently tender coconut water braised Kurobuta pork cheeks, the ingredients held together to form a beautiful marriage with the flavourful Marsala & bone marrow sauce. (3) The third appetiser was the Hokkaido Scallops, which were perfectly seared and delectably soft. 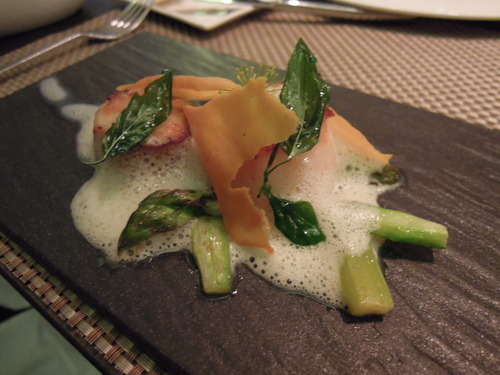 It was served with asparagus and some paper-thin Tumeric tuile that gave a magnificent crunch. The Thai green curry emulsion provided this dish a bit more punch. 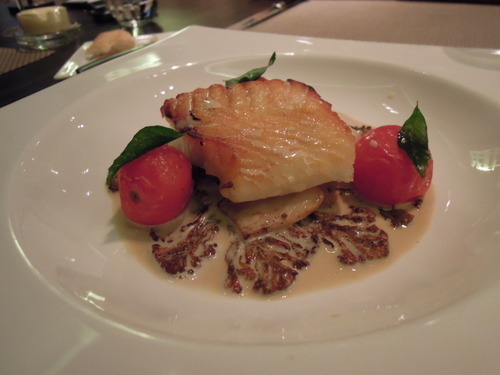 (4) Aside from the juicy and supple Chilean Sea Bass and the flavour-packed Oyster mushrooms, a gem was to be found in the Conpoy & curry leaves cream sauce which was extravagantly creamy and tasty. This dish demonstrated how fusion cuisine should be done – bold and innovative, yet harmonious and never confusing. 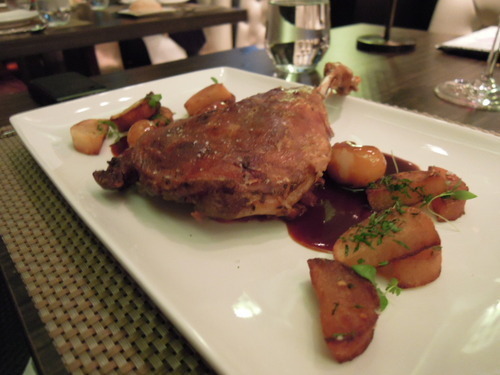 (5) The crispy-skinned Duck Confit was lip-smackingly good. Served with faultless braised red cabbage and pommes sarladaise and drizzled in a dark Lychee gastrique, it left a huge smile on our faces. 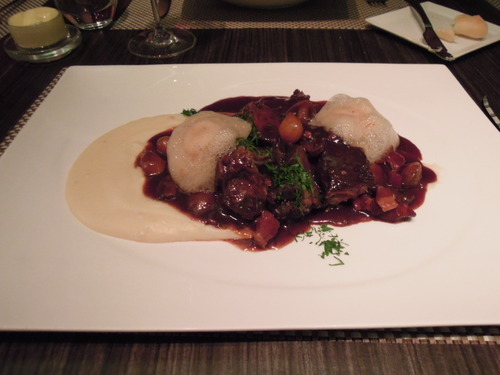 (6) This dish was not a typical French Beef Bourguignon, but could satisfy even the most demanding palette. The 36-Hour Braised short rib cooked in red wine and Kecap manis (an Indonesian sweet soy sauce) was accompanied by moreish bacon, mushrooms and pearl onions and some magically smooth pomme purée (i.e. mashed potato). Adorned with Guinness froth, this dish was deliriously tasty. 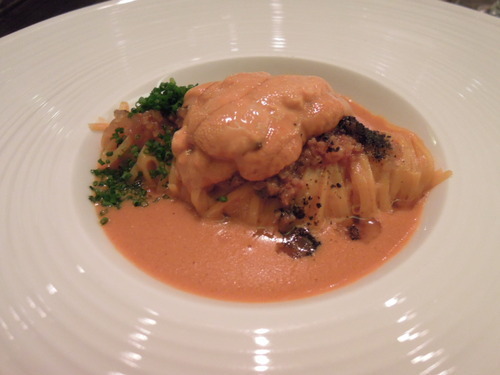 (7) The Uni Tagliolini was permeated by the rich flavours of uni. Served in acrustacean cream sauce that tasted sea-fresh, chef Adrian Ling attended to the finer points of his cuisine by adding a sprinkling of finely chopped chives, pork gratons and nori. (8) Just as we were basking in the afterglow of the main courses, Pamplemousse impressed us further with their formidably scrumptious desserts. 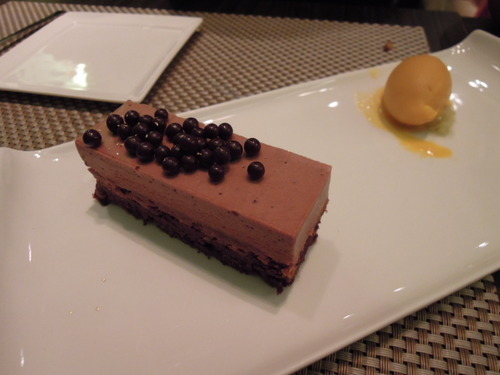 The Hazelnut dark chocolate cake and Valrhona chocolate crémeux were served with a dollop of mango sorbet perched on mashed green mango. The little chocolate beads popped and cackled in the mouth, and the mango sorbet added a fruity counterpoint to the rich and creamy chocolate cake. 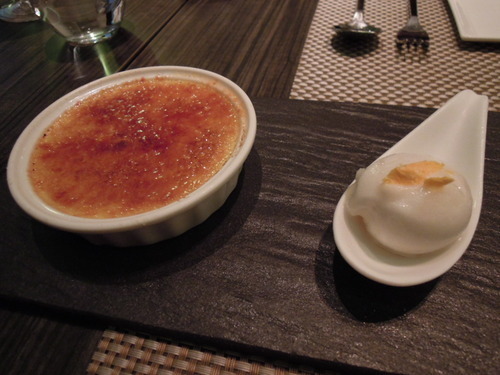 (9) Pamplemousse added a touch of originality to the traditional Crème Brûlée by adding to it Osmanthus flavours and serving it with a scoop of icy, refreshing Lychee sorbet. Even though the taste of Osmanthus was barely noticeable, we still loved every spoonful of this dessert! (10) The restaurant’s crowning glory was this “Milo Dinusaur”, which presented a local Singaporean drink called Milo Dinosaur as a dessert. 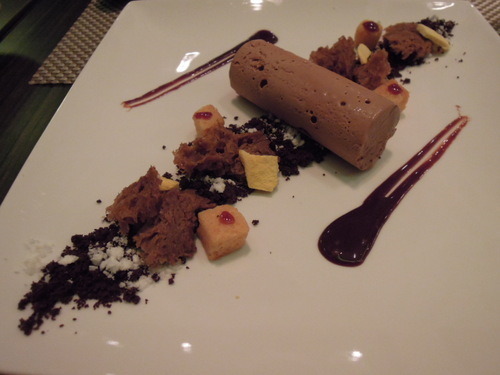 The Milo parfait was deliciously cold and creamy, and was accompanied by some crumbly Chocolate streusel, Milo sponge, Dulce de leche, Brioche cubes and condensed milk powder. This was a dessert where the serene presentation was matched by its sophisticated taste, and we were bowled over by the kitchen’s ingenuity. 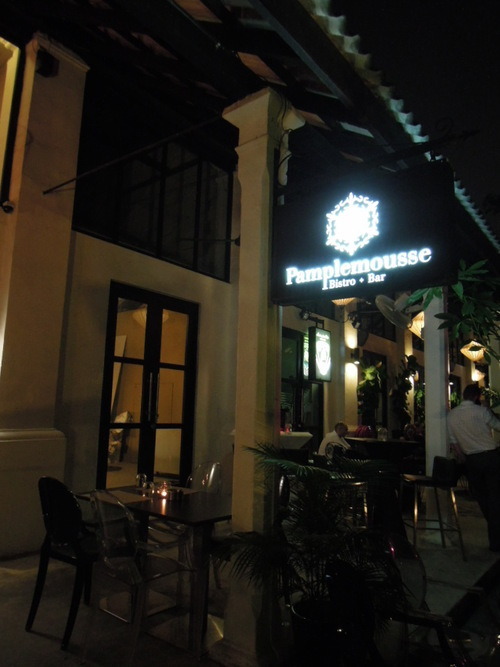 Conclusion: For a night of culinary extravaganza only at US$90 per head (including wine), what is not to love about Pamplemousse?